SentryBay Data Protection Suite is a comprehensive data security software that provides real-time protection against key loggers, screen capture attacks, and phishing. With Data Protection, which comes with features of anti-key logging, anti-screen capture (EntryProtect) and anti-phishing (PhishLock), users can worry-free of the phishing threat and online identity and data theft. For users who are confusing, SentryBay Data Protection Suite supplements the strengths and features from conventional antivirus software. Some new features have been added while the speed, efficiency and performance level is increased. In addition, Data Protection Suite also provides proactive protection to every keystroke from malicious software and prevents data capture from malware. Then, click “Please click here to start the download”. The download will start immediately. 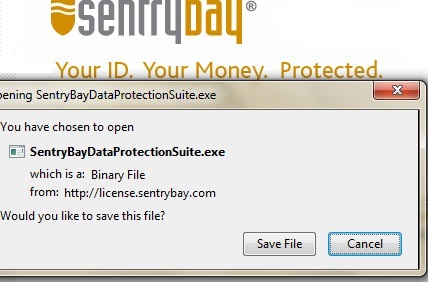 Once download of SentryBayDataProtectionSuite.exe is completed, install the software. Note: Before finish the installation, there will prompt that asks users to send “anonymous usage data” to SentryBay – uncheck that option if users do not want to do that. SentryBay Data Protection Suite supports Windows XP, Windows Vista, and Windows 7 32-bit operating systems.